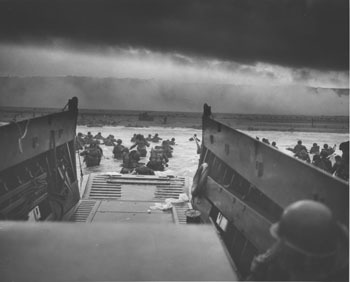 On June 6, 1944, the United States and its allies launched the greatest amphibious invasion in history on the shores of France. Over 150,000 soldiers, sailors, and airmen stormed the beaches of Normandy beginning a campaign that would end with the unconditional surrender of Germany in May 1945. Franklin D. Roosevelt, as Commander in Chief of the United States Armed Forces during World War II, played an active and decisive role in determining strategy. In his ongoing discussions with British Prime Minister Winston Churchill and with the American Joint Chiefs of Staff, he steadily promoted the invasion of the European continent to liberate it from Hitler’s Germany that finally began on D-Day. On the night of June 6, 1944, President Roosevelt went on national radio to address the American people for the first time about the Normandy invasion. His speech took the form of a prayer. June 16 will mark the 79th anniversary of the 100th day of FDR’s “First 100 Days” as president. Those 100 days were a period during which FDR advanced and passed at least 15 MAJOR pieces of legislation to relieve the suffering of the American people, stabilize the banks, stabilize the country, and reassure Americans that there was a president in the White House who was creative, aggressive, caring and courageous. We need to celebrate FDR’s wisdom, creativity, aggressiveness, caring and courage, without which we might be living in a very different (and worse) world today. FDR issues a proclamation declaring a four-day “bank holiday” throughout the nation effective March 6. All banking transactions stop and embargo on exportation of gold, silver, and currency. Summons Congress to special session for March 9. “Hundred Days” session FDR gets a willing Congress to enact many of the New Deal programs. This first day Congress passes the Emergency Banking Act, giving FDR broad powers over banks and foreign exchange. Bank holiday ends March 10–banks can reopen when they prove that they are solvent. Within three days, 1000 banks will reopen and national confidence picks up. FDR gives first “fireside chat”. Congress passes the Reforestation Relief Act, establishing the Civilian Conservation Corps (CCC); it provides work immediately for 250,000 young men (18-25) in reforestation, road construction and developing national parks. Work camps begin to spring up. By the time it eases in 1941, two million people have worked on its projects. FDR takes the nation off of the gold standard. Congress passes the Federal Emergency Relief Act, which authorizes immediate grants to states for relief projects. Unemployment has reached 14 million-over one quarter of the nation’s work force. Roosevelt signs the Agricultural Adjustment Act to provide immediate relief to farmers by setting prices for agricultural products and paying subsidies to farmers for curtailing production of certain crops that were in surplus. Congress establishes the Tennessee Valley Authority (TVA) to construct dams and power plants along the Tennessee Valley; electricity will go to residents, many of whom lacked it previously, and fertilizer will be sold. Congress passes the Federal Securities Act to monitor and regulate stocks and bonds. Congress passes the Home Owners Refinancing Act to provide mortgage money and other aid to homeowners. It will go out of business in June 1936 after providing loans for some one million mortgages. The final day of the “Hundred Days” session. Congress passes the National Industrial Recovery Act (NIRA) establishing the Public Works Administration (PWA) and the National Recovery Administration (NRA). The PWA is authorized to supervise the construction of roads, public buildings and other projects while providing employment. Secretary of the Interior Harold Ickes is tapped to head the PWA. The NRA’s goal is to stimulate competition and benefit producers and consumers by implementing various codes to establish fair trade. Compliance was to be voluntary; those who cooperate received the blue eagle “seal of approval.” NRA is to be directed by General Hugh Johnson. It will be declared unconstitutional by the Supreme Court in May 1935. Congress also passes the Farm Credit Act and the Banking Act of 1933 (which establishes FDIC).